A young man is lured into gang violence and is eventually forced to leave Niger. When he returns home a changed man, he decides to intervene in the violence he once created. Niger is the poorest country in the world with an extraordinarily high percentage of young people. With radical extremist groups like Boko Haram recruiting heavily amongst youth, a moderate middle voice needs to be elevated. Prevent violent extremism in this area is important for stabilizing the Sahel region at large. Novo was brought on board by Search for Common Ground to create dialogue and understanding through cinema. Novo led a series of collaborative and participatory filmmaking workshops in three communities across Niger. The film series was then screened in Mobile Cinema community screenings across Niger, Burkina Faso and Chad. After each screening, the audience was encouraged to debate and discuss the films. By including everyone in the discussion, extremist ideologies like violent extremism have a public forum to be combated. Together, in five days, we wrote, cast, and shot a film in each community hand-in-hand with young people that illuminated the issues they wanted to bring to the forefront. We did a filmmaking bootcamp and all production roles were filled by young people, from scriptwriter to actor to producer. This participatory filmmaking process gave the youth the leadership to choose what they wanted to say to their own communities, bringing issues like gang violence, election fraud and intercommunal conflict into the stories. 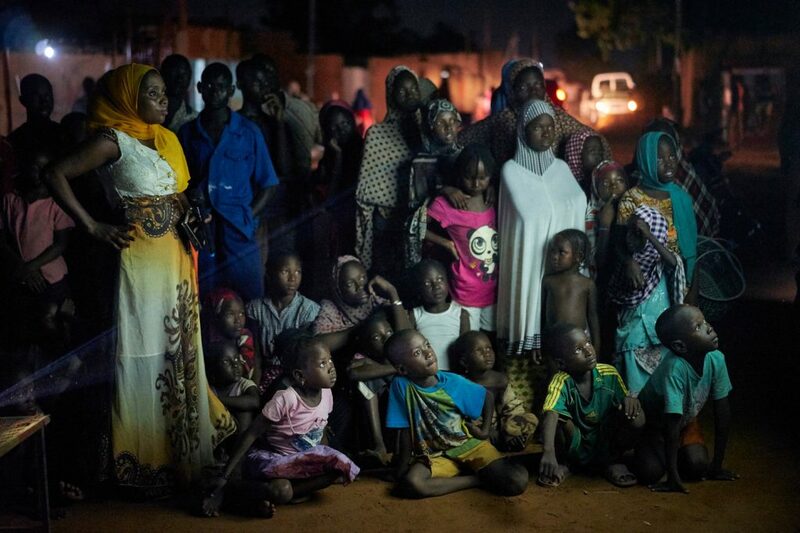 An audience watches a film as part of a Mobile Cinema screening in the neighbourhood of Talladjé, Niamey, Niger on September 29, 2016.